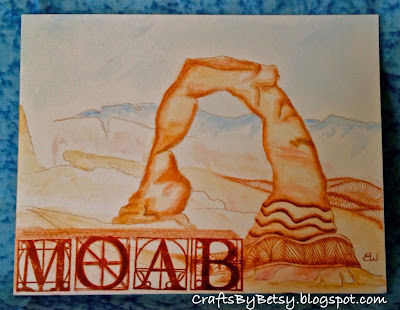 Back from vacation in Moab and the One-Layer Simplicity Challenge this month is travel themed: Road Trip! How appropriate is that? I'm not sure that this card is simple, but it's definitely one layer. I didn't really have any appropriate travel stamps. I was glancing at some entries when this card caught my eye. 6 1/2 year old Leah inspired me to draw my card! I started with Strathmore Imperial 140 lb hot press watercolor paper cut 4 1/4" x 11" and folded in half. Next I sketched in pencil, then brown sakura micron pen before erasing the pencil. Next some water coloring with Derwent Inktense pencils. 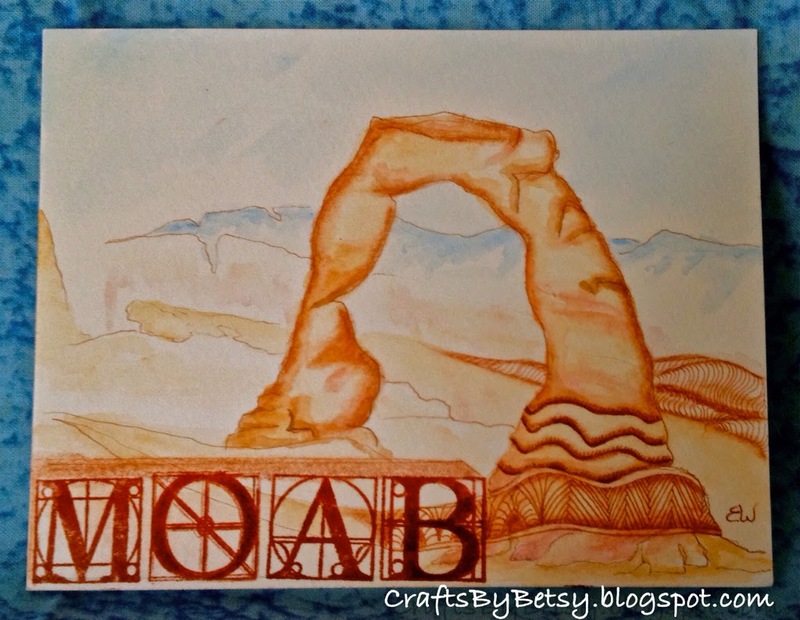 Moab is stamped from the Davinci Alphabet set by Hampton Art using a stamp positioner. I thought it needed a touch of Zentangle® and the patterns used, spell out Utah: Undling, Tearce, Archer and Hibred all tangled with the Sakura micron again. Final shading was done with Stabilo CarbOthello Pastel Pencils. I liked the job it did on the zentangle shading, but found it a little too heavy on the rest of the drawing. Thanks Leah! Check out Zentangle.com to find out more zentangle, or tanglepatterns.com for the patterns I used. This is so cool! This card conveys the majesty of the location perfectly - I love all the little details! So glad you joined us for our Road Trip at OLS this month! Fantastic! The alphabet works beautifully with you lovely art.